Edition: MP3 - Unabridged CD. In This Explains Everything, John Brockman, founder and publisher of Edge.org, asked experts in numerous fields and disciplines to come up with their favorite explanations for everyday occurrences. Why do we recognize patterns? Is there such a thing as positive stress? Are we genetically programmed to be in conflict with each other? 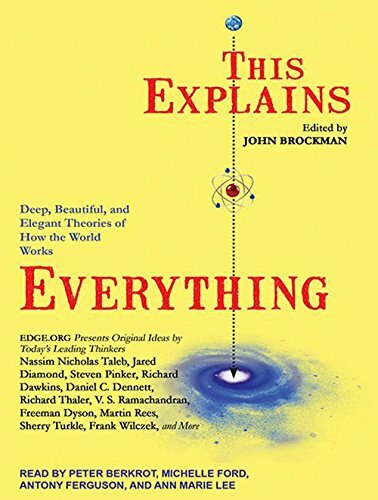 Those are just some of the 150 questions that the world's best scientific minds answer with elegant simplicity.With contributions from Jared Diamond, Richard Dawkins, Nassim Taleb, Brian Eno, Steven Pinker, and more, everything is explained in fun, uncomplicated terms that make the most complex concepts easy to comprehend.